This starter requires concentration and sharp mental arithmetic! On mini whiteboards or a scrap of paper draw a 4 x 4 grid. 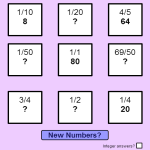 You have 60 seconds to try and fill the grid with correct answers. The questions are only shown for a second at a time so you have to think fast! When time is up you can review the questions and answers by clicking on the tiles.